The Titans struggled to find consistency during Mike Munchak's reign as head coach (2011-13), bookending two losing seasons with a 9-7 mark in 2012 -- which didn't lead to a playoff berth. 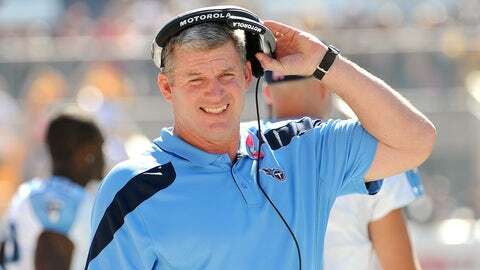 NASHVILLE, Tenn. — The Tennessee Titans have fired Mike Munchak after three seasons as head coach. On Saturday, general manager Ruston Webster confirmed the firing in a statement released by the team. "The last week has been a difficult time trying to navigate through many issues to find the best resolution for this franchise moving forward," Webster said. "Tough choices were presented to all sides and the end result was to part ways and move forward without Mike. "We will immediately begin a search for a new head coach." In three seasons, Munchak went 22-26 as head coach, including 7-9 this past season — Tennessee’s fifth straight campaign of not reaching the postseason. The Titans were a disappointing 6-10 last year after going a promising 9-7 in Munchak’s debut season of 2011. Munchak has been a part of the franchise since 1982 when the then-Houston Oilers drafted him as an All-American lineman out of Penn State. After a Pro Football Hall of Fame playing career, he was offensive line coach with the Oilers/Titans since 1997 before following Jeff Fisher as head coach in 2011. "First, I want to thank Mike Munchak for his professionalism through this process and thank him for his years of dedication to the Titans/Oilers organization," Webster said. "He is first-class, and I wish him and his family nothing but the best. "I also want to praise Tommy Smith for his involvement during the weeklong process. He was thorough and thoughtful." Various reports from the weekend had Munchak returning for a fourth season, but a press release Friday night from the team quoted both Smith and Webster stating that a decision had not been made. Apparently that changed on Saturday, and Munchak was fired with one year remaining on his contract that was to pay him $3 million. "Let me start by saying that I have the utmost respect for Mike Munchak and what he has meant to this franchise as a player, position coach and head coach," Smith said in a team release. "He is one of the most genuine people I have ever known and he will always be a large part of our history, which I am thankful for." Smith said in the statement the decision was finalized today after several meetings and discussions throughout the week since the season-ending win Sunday over Houston. "We had a number of discussions and meetings as an organization since the season ended, including the all-day meeting (Friday), and those discussions continued into today," Smith said. "Ultimately, we decided it was best to move in different directions." Several Titans players reacted Saturday to the firing of Munchak with nothing but praise for the outgoing head coach. "He was a great guy and great coach who is a man of integrity," Titans fullback Collin Mooney said of Munchak. "You definitely want to play for a man like that. I couldn’t be more thankful and blessed that he believed in me and gave me a chance. "It’s a shame to see him go. I wish him the best with whatever comes next." Rookie center Brian Schwenke, who was drafted out of California to be the center of the future, said spending the season under the tutelage of Munchak and offensive line coach Bruce Matthews, also a Hall of Fame member, was invaluable. "Coach Munchak is a great coach and I loved having this year with him," Schwenke said. "I learned so much as far as O-line stuff goes. I enjoyed this year, and I wish it could have been longer. "But this is the NFL and it’s a business. I guess I am learning that." After starting the past season 3-1, the Titans lost three straight games to playoff-bound Kansas City, Seattle and San Francisco before a win over St. Louis put the team at 4-4 heading into the second half of the season. But the Titans had lost its starting quarterback for two games after the 3-1 start with a shoulder injury. And he would also miss the last seven games with a foot injury, leaving some to think Munchak might get a pass because he had his starting quarterback for only seven games this season. Even so, the Titans still had to beat lowly Jacksonville and Houston to close the season with seven wins. That finish alone wasn’t apparently enough to help Munchak keep his job. They also had a five-game home losing streak, longest since the team moved to Nashville in 1997. "The three of us met all day today in Houston," Webster stated on Friday. "We had a good conversation in regards to the team and moving forward. Nothing final has been decided at this point, but we hope to have a decision soon." Munchak has been mentioned as a possible candidate to become head coach at Penn State after Nittany Lions coach Bill O’Brien became head coach for the Houston Texans. Reportedly, Miami (Fla.) coach Al Golden will also interview for that PSU position. As for possible candidates to replace Munchak, there is a groundswell of local support for Vanderbilt coach James Franklin. He has been mentioned in connection with various college and NFL coaching vacancies, including Penn State and Texas. "I am confident that we will find a coach that can continue our growth as a team and lead us to sustained success," Webster said.